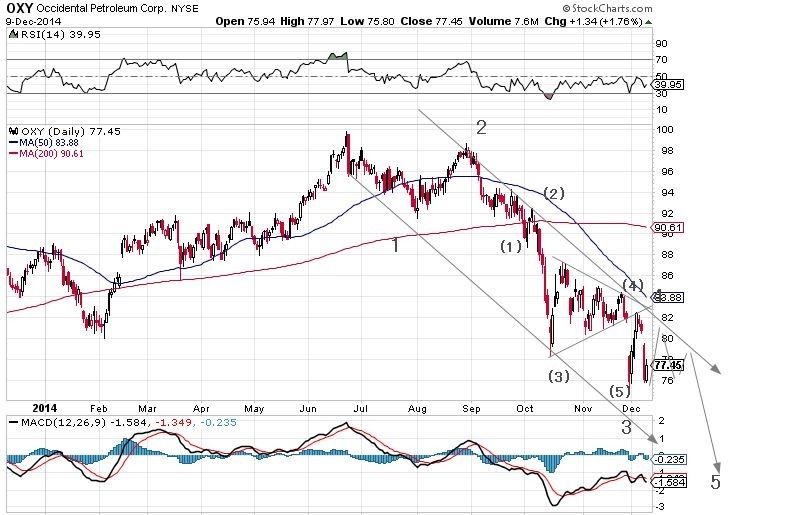 Like most others, OXY topped out in 2011, completed a first leg down and then corrected that with an a-b-c wave 2. That puts us in wave 3 starting from about $100. A very good looking triangle was formed around the $83 level. To keep the proportions more or less right, this must be a 4th wave, however not of the entire wave 3 but just of wave 3 of 3. That puts us in wave 4 (which may also become a triangle), to be followed by wave 5. 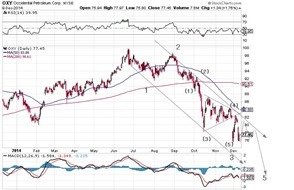 This wave should take the stock below $71. Then we still need 4 and 5 to take the stock to below $44. By that time the stock will have lost $76 out of $120, close to the 62% normal target. To help things along, the stock has been downgraded by several investment firms. However the target prices are still for the most part above $100. This is another way of saying that they do not have a clue but definitely want you to feel warm and fuzzy about the stock.